What will be the absolute fastest way to load data from a flatfile into a table within SQL Server 2016? A lot has changed since my initial post on this topic many years ago, ike the introduction of In-memory optimized tables and Updateable Columnstore table indexes. 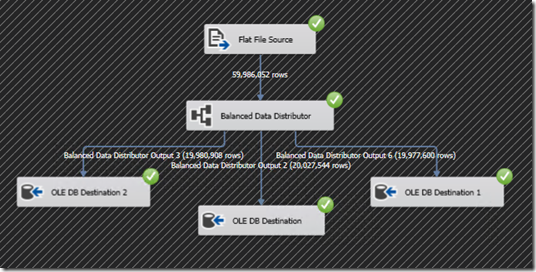 Also the list of data transport vehicles to choose from is growing: besides BCP, the T-SQL Bulk Insert command, SSIS as ETL tool and PowerShell there are some new ones added, like PolyBase, External R Script or ADF. In this post I will start with the checking how much faster the new durable & non-durable In-memory tables are! For these tests I’m using an Azure DS4_V2 Standard VM with 8 cores/28 GB of RAM and 2 HDD Volumes with host caching R/W enabled. (Both Luns provide ~275 MB/sec R/W throughput although the GUI states a limit of 60MB/sec). I generated a single ~60 Million row/7.2 Gigabyte TPCH lineitem flat file as data to load. This regular Bulk Insert command completes within 7 minutes with an average of 143K rows/sec. 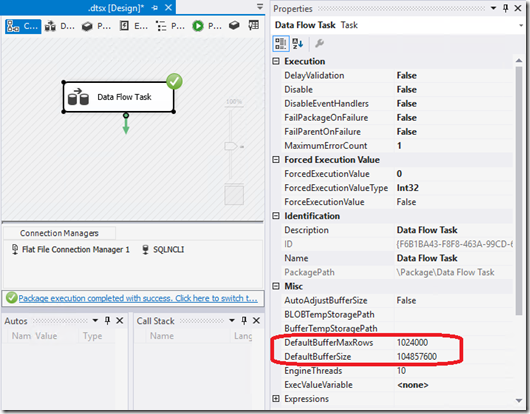 The (in SQL2014/2016 Enterprise & developer Edition ) introduced in-memory tables are designed for very fast OLTP with many small transactions and high concurrency, which is a completely different type of workload as bulk inserting… but, just out of curiosity…lets give it a try! There are 2 types of in-memory tables: durable and non-durable tables. The durable ones will persist data on disk, the non-durable ones won’t. To enable this option we have to do some housekeeping and assign a fast disk volume for hosting these files. Extra memory pools are managed via the SQL Resource Governor. The 4th and last step is to bind the test database to the new memory Pool with the sys.sp_xtp_bind_db_resource_pool command. In order for the binding to become effective we have to take the database offline and bring it back online. Once bound we can dynamically change the amount of memory assigned to its pool via the ‘ALTER RESOURCE POOL PoolHk WITH (MAX_MEMORY_PERCENT = 80 )’ command. Now we are all set with the In-memory option enabled, we can create an in-memory table. Every memory-optimized table must have at least one index (either a Range- or Hash index ) which are completely (re-)composed in memory and are never stored on disk. Specifying a batch size of 1 (up to 5) Million rows to the bulk insert command helps to persist data to disk while the bulk insert is ongoing (instead of saving it all at the end); doing so minimizes memory pressure on the memory pool PookHK we created. 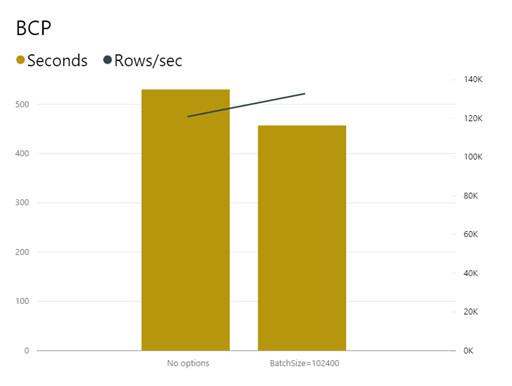 The data load into the durable In-Memory table completes in 5 minutes 28 seconds, or 183K Rows/sec. That’s an ‘okay’ time but not that much faster than our baseline. Looking at the sys.dm_os_wait_stats shows that the no.1 waitstat is ‘IMPPROV_IOWAIT’ which occurs when SQL Server waits for a bulk load I/O to finish. Looking at the Performance counter ‘Bulk Copy Rows/sec and Disk Write Bytes/sec shows the flushing to disk spikes of 275 MB/sec once a batch got in (the green spikes). That is the maximum of what the disk can deliver but doesn’t explain it all. Given the minor gain, we will park this one for future investigation. There is insufficient system memory in resource pool ‘PookHK’ to run this query. So far so good! Now lets move on and check out how staging in a non-durable table performs! For IMND tables we do not need a Primary key so we just add and Non-clustered Hash index and set DURABILITY = SCHEMA_ONLY. 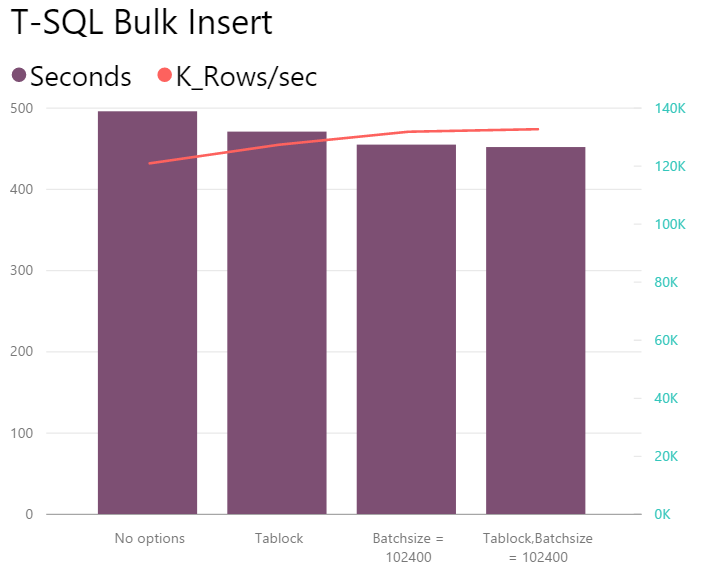 The Bulk insert Data loading into the non-durable table completes within 3 minutes with a throughput of 335K rows/sec (vs 7 minutes)! This is 2.3x faster then inserting into a heap table. For the staging of data this definitely a quick win! 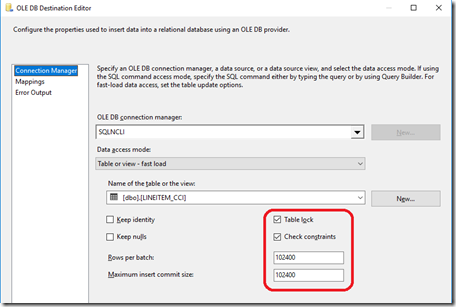 Traditionally SSIS is the fastest way to load a file quickly into SQL Server because SSIS will handle all the data pre-processing so the SQL Server engine can spend its CPU ticks on persisting the data to disk. Will this still be the case when inserting the data into a non-durable table? 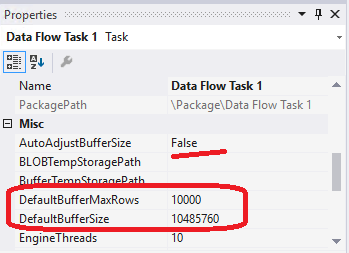 Below a summary of the tests I ran with SSIS for this post: the SSIS Fastparse option and the ‘DefaultBufferMaxRows’ and ‘DefaultBufferSize’ settings are the main performance boosters. Also the Native OLE DB (SQLOLEDB.1) provider performs slightly better than the SQL Native Client (SQLNCLI11.1). When you run SSIS and SQL Server side by side,increasing the network packet size isn’t needed. 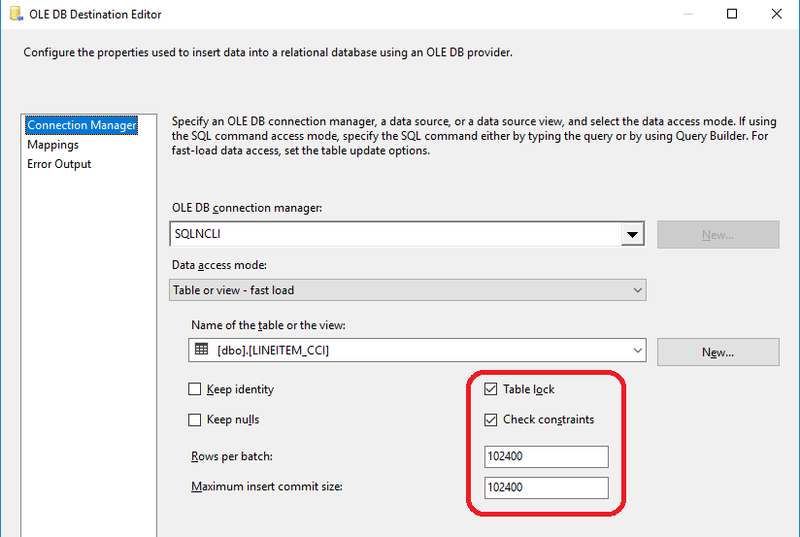 Net result: a basic SSIS package that reads a flat file source and writes the data out directly to the Non-Durable table via an OLE DB destination performs similar as the Bulk Insert command into a IMND table: the 60 Million rows are loaded in 2minutes 59seconds or 335K rows/sec, identical to the Bulk insert command. But wait… the in-memory tables are designed to work ‘lock & latch’ free so this means that we can load data also via multiple streams! 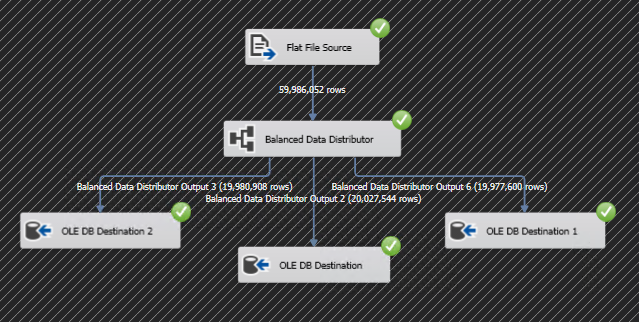 That is easy to achieve with SSIS; the Balanced Data Distributor will bring just that! 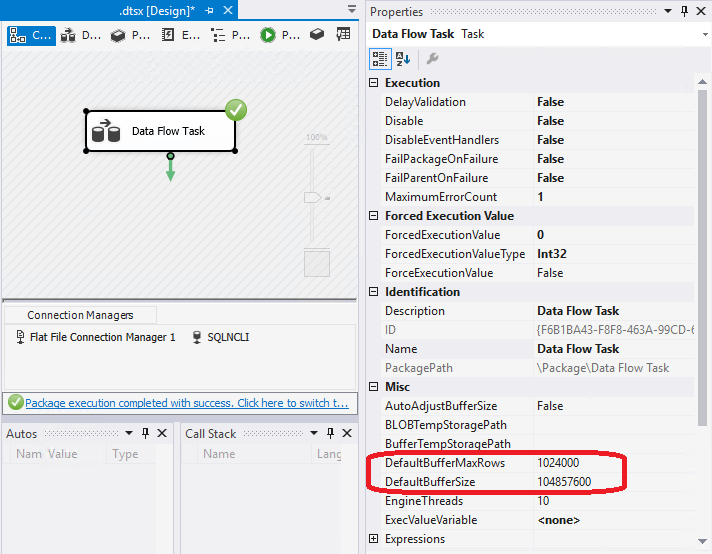 (the BDD is listed in the Common section of the SSIS Toolbox) Adding the BDD component and inserting the data into the same Non-durable table with 3 streams provides the best throughput: we are now up to 526000 Rows/sec! Looking at this very flat line, with only 160% of CPU time used by SQLServer, it seems we are hitting some bottleneck: I quickly tried to be creative by leveraging the modulo function and added 2 more data flows within the package (each processing 1/3 of the data) but it that isn’t improving much (1 min52sec) so a great topic to investigate for a future post! The In-Memory Non-Durable table option brings some serious performance improvement for staging of data! 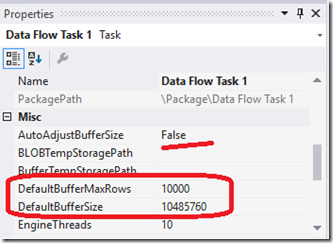 loading data 1.5x faster with a regular Bulk insert and up to 3.6x times faster with SSIS. This option, primarily designed to speed up OLTP, can also make a huge difference to shrink your batch window quickly!